While my last blog post featured the biological phenomenon of commensalism between the purple pitcher plant and the mosquito Wyeomyia smithii, today’s blog will focus on the considerably more malicious act of parasitism. 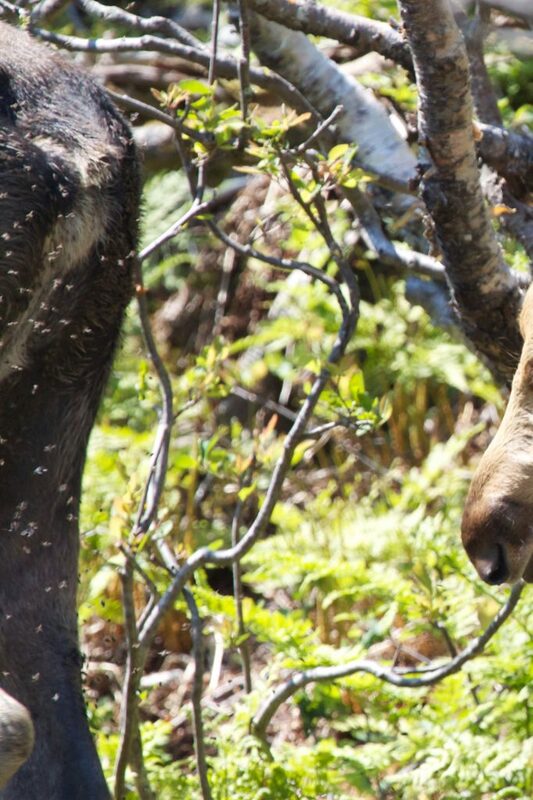 The hind legs of the mother moose, spotted on Gros Morne Mountain, swarmed with a horde of Haematobosca alcis. As Jill mentioned in her previous post featuring Gros Morne Mountain, we were lucky enough to come across a moose and her young calf browsing the vegetation along the mountainside during our hike. Being the easily excitable photographer that I am, I immediately began to capture as many photos of the pair that I could manage – one of these photos revealed the parasitic relationship I hinted at earlier. The hind legs of the mother were swarmed with a legion of flies. The Moose fly, Haematobosca alcis, is yet another dipteran that sustains itself off the blood of mammals, though thankfully not humans this time around. As the name suggests, this fly solely targets the moose (Alces alces) and as such their range extends all across North America wherever moose may be found. You’ll spot the moose fly primarily on the hind legs or rump of their host where they can be seen swarming large, bloody open sores. The masses of H. alcis individuals will each imbibe themselves on the blood from these sores, though curiously the sores will rarely become infected, suggesting some antibiotic action on the fly’s part. 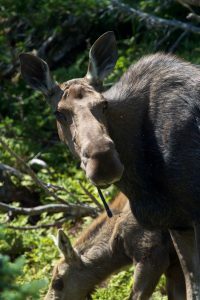 The parasitized moose do not appear to be in any immediately apparent discomfort due to the flies, nor do any significant maladies arise as a result of the parasitism – the sores appear to completely heal come the winter. Owing to the complete dependence H. alcis has on A. alces, even the reproductive cycle of the moose fly is inherently linked to the moose. The females will briefly stray from their host for a moment to lay her eggs within the moose’s feces, after which she will quickly return to the bloodied sores. Once the eggs hatch, the larvae will then feed on the feces, burrow down underground to pupate, and emerge as an adult the next summer after an overwintering phase. If you’re fortunate enough to come across any moose during the summer months, keep an eye out for these flies and think of the BIObus!